We took the family to the Missouri Botanical Garden in St. Louis this past weekend. We had quite a time among the gorgeous displays and we ended up taking home a few plants from the gift shop. This botanical haul included a venus fly trap. Venus flytraps are the most commonly recognized and cultivated carnivorous plant. When we took the one home pictured below, the botanist who sold it to us offered some great tips on caring for a venus fly trap. Give them as much light as you can. Full direct sunlight for at least four hours a day is best. 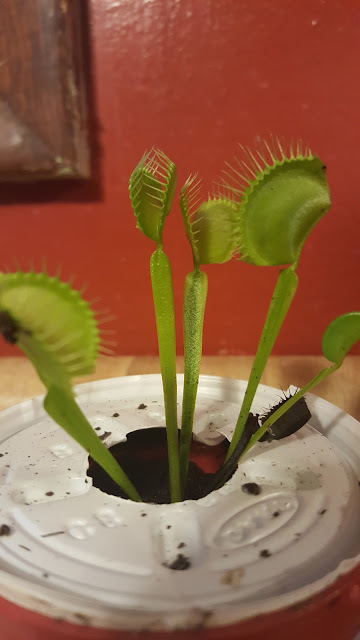 Water your venus fly trap with “pure” water (low in mineral content), either distilled or rain water. Do not keep them sitting in water. They prefer damp soil in a nutrient poor medium such as peat, sphagnum moss or sand and perlite in some combination. There's no need to catch insects for them and feed them directly. They'll handle that themselves.